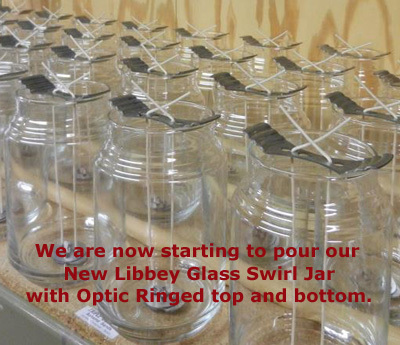 the new round "Libbey Glass Swirl Optic Jar"
Simply enter the Quantity and the Fragrance in the above Boxes. We are now shipping our "New Libbey Glass Swirl Optic Jar"
with a round Glass Lid. projects a dancing light pattern as it burns. The paneled jars are being phased out. This Candle is Made in some of Your Favorite Floral Scents like : Sweet Pea, Gardenia, Stargazer Lily, Hydrangea, Country Heather, Evening Rose, White Lilac, Honeysuckle, Wild Flowers, Lavender, Plumeria, Citrus Sage and More ... Plus this candle is Available in All the Fruit Scents, Bakery Scents, Outdoor Scents and Traditonal Holiday Scents... Look over the Great List to choose from . Destroys Bad Odors like...Tobacco, Pet, and Food Cooking Smells. Our 2 Wick Smoker Jar has 2 wicks for even burning.
" You Can't Buy A Better Scented Jar Candle "
Thank's again for your interest in our Candles ... Place an order today.